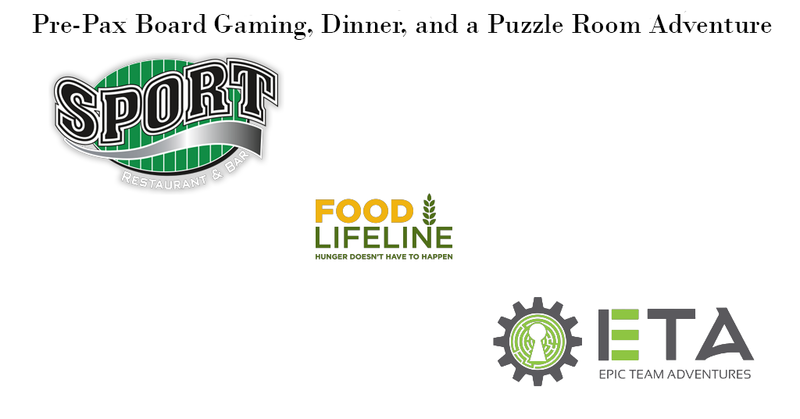 On the night before PAX, please join us in a private room at Chef John Howie’s SPORT Restaurant & Bar starting at 5pm for board gaming, dinner and fun. Then dash over to neighboring Epic Team Adventures for your puzzle room adventure. When finished, come back to SPORT for more good times! This event is being held on Thursday, September 1st from 5pm until 11pm. All net proceeds from ticket sales will benefit Food Lifeline – helping to feed hungry people in Western Washington. Ticket price includes dinner, a drink, puzzle room admission, access to our board game library, and random prize drawings. The board game library will include many of the newest releases from Gen Con 2016 such as Captain Sonar, Via Nebula, and Pandemic: Reign of Cthulu. Here is a photo of more Gen Con 2016 games in our library. Dinner will be a choice from a special menu including house made Angus burgers, hand tossed pizzas, Jambalaya and more. Also, you will have a choice of craft beer, specialty cocktails and mocktails included with your ticket purchase. Additional drinks will be available for purchase with $1 from the sale of each drink benefiting Food Lifeline. At ticket purchase time, choose either the Vault of the Volcano God or the Sparrow Files puzzle room. Tickets and times are limited. Please choose your ticket and desired game / time from our list of choices on Brown Paper Tickets. Note that this ticket page may display better on a non-mobile browser. The table top gaming continues at John Howie’s SPORT Restaurant and Bar. Random prize drawings will be held throughout the night, and ETA staff will be on hand to help direct you to your their facility. Both locations are in the Queen Anne neighborhood of Seattle, and SPORT is located across the street from the Space Needle. Through a melding of Hollywood-quality sets, cutting-edge technology, seamless integration of theatrical effects, and well-designed puzzles, we transport you into narrative adventures that will inspire you to return for more. We design our rooms to be other-worldly destinations for you to investigate. We offer you the tools to solve their puzzles and unlock their secrets. All that you need to provide is yourself and a group of friends who love testing their wits together. ETA Launches Epic Adventure Club See a Sneak Preview of “The Accountant” for free!